All Things Dog Blog All Things Dog Blog: Pet Blogger Introductions:"Nice to Meet You"
Jack and A.J. over at Pup Love invited us to join another blog hop this weekend, designed to introduce ourselves. I see their point. When you enter the world of blogging, and everyone already seems to know one another, you can sometimes feel a bit lost. It's sort of like transferring to a new middle school and trying to figure out where to sit at lunch. Everyone seems to have friends and is already having fun. What a great idea to help us all get acquainted without playing that peer pressure game. Below is a quick shot at my hello. Feel free to leave questions in the comments, and I'll spill. No lack of words here! Names: Tanner, the Golden Retriever, and Oliver, a Papillon. Xena left us for the Rainbow Bridge in October. You can read about her at her eulogy, and I've linked to one post for Tanner and Oliver that will help you get acquainted. 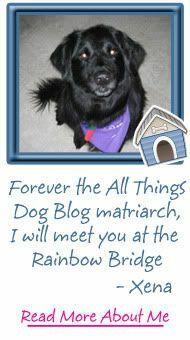 Blog: Carrie writes All Things Dog Blog. Tanner and Oliver offer commentary and general silliness at 5 Minutes for Fido. Age: Tanner is 4 1/2 and Oliver is nearly 3 1/2. Breeds: Tanner is a Golden Retriever that was a non-standard pup. His breeder practically gave him to us for a food/medical donation. He's far too tall, has an unusually short coat for a Golden, and a knobby occipital lobe, but I love him all the same. I still find it hard to believe anyone could not have loved this goofy, affectionate, loyal dog. 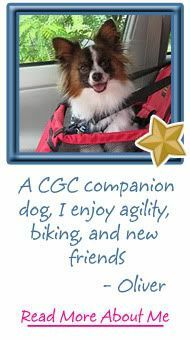 Oliver is a Papillon with an interesting adoption story. You can read it at the link above in the Name category. You'll probably enjoy the antics of my daughter--his savior. Best trick: Oliver performs "Go Nite Nite", which translates to "crate" at the speed of light. He also has an adorable pirouette at dinnertime, just to show his excitement. It's an endearing behavior that everyone seems to enjoy witnessing. The answer to Tanner's best trick is a toss up. He's an excellent Houdini, managing to unlatch crates, unlock gates, open our front door and even unlatch a child-guard-protected baby gate that humans cannot figure out. He's probably pretty proud of his Houdini skills, but he also takes mealtime very seriously and will sit and wait permission to eat, in a puddle of drool if necessary, until I give him the go ahead. Then there's Fetch. 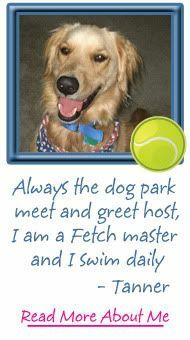 He's an ace at Fetch, Drop It, Leave It, and swimming is his favorite activity. We have spell that word around him. He's one busy guy. Favorite toy: No good answers here. Tanner loves ALL toys, even Oliver's little 'baby' toys. He enjoys everything he has permission to play with--thankfully not hubby's hats or shoes. Oliver is another story, but lately he likes the toys that you insert an empty plastic water bottle inside. He loves their crinkly sound, and these toys are light weight enough for him to pick up and drag around. At 9 lbs., he can't play with Tanners 'big boy' toys. Best Friend: Oliver is true to his companion dog heritage. He's bonded to me and hubby and spends most of his time keeping us company, pretty much no matter what we're doing. When he's not with us, he's usually chewing on Tanner's ears, an activity that Tanner seems to think is more of an ear massage--he loves it! Tanner, on the other hand, is the epitome of an extrovert. He knows how to work a party and demonstrates those skills at the dog park quite enthusiastically each week, stopping to sniff and visit with everyone. Some even get personal kisses. Best friends? I can't even guess. Worst Enemy: Tough question. I suppose Oliver is not fond of a thunder storm. He tends to lie down close by and not leave my side. No behavioral issues--he just wants to be near me when the rumbles get going. Tanner's only enemy is a barrier. He doesn't like to be held back from a social opportunity. If he's off leash--such as at the dog park or in my yard--he'll behave admirably and friendly. He'll heel and walk with me like a perfect angel. Put him on a leash for a walk and sometimes he'll decide he absolutely must visit that friend that is two blocks down. At 70 lbs., I have to put on my imaginary Pack Leader hat and really play boss when I walk him. 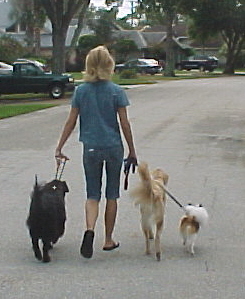 Thank goodness for good training as a puppy, or he'd be dragging me around like those poor owners on the Dog Whisperer. Proudest Moment: Tanner is the most proud each time he bolts through the gate at the dog park, making his victory lap, as if to say "I'm here. Let the party begin!" Oliver now has 2 proudest moments and I can't possibly leave either out. Earning his CGC (Canine Good Citizen) was a big deal for him. Sit and Down always seemed to mean the same thing, so we found ourselves struggling with the simplest of concepts to overcome. Recently Oliver was accepted into Dogs for the PAWS, and his portrait was painted as a part of this project to build awareness for rescue dogs. We're totally smitten with Miss Anna Marie's fab art. He's so proud; he's bursting. (Me too!) Now he's officially part of the Paws Pack 80; what's not to be proud of about that! All Things Dog Blog's Niche: Here's one more tweak. 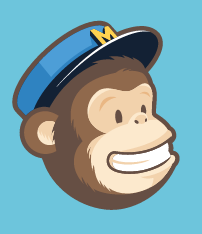 If I'm introducing my blog, I might as well offer up some kibble on what we're all about. 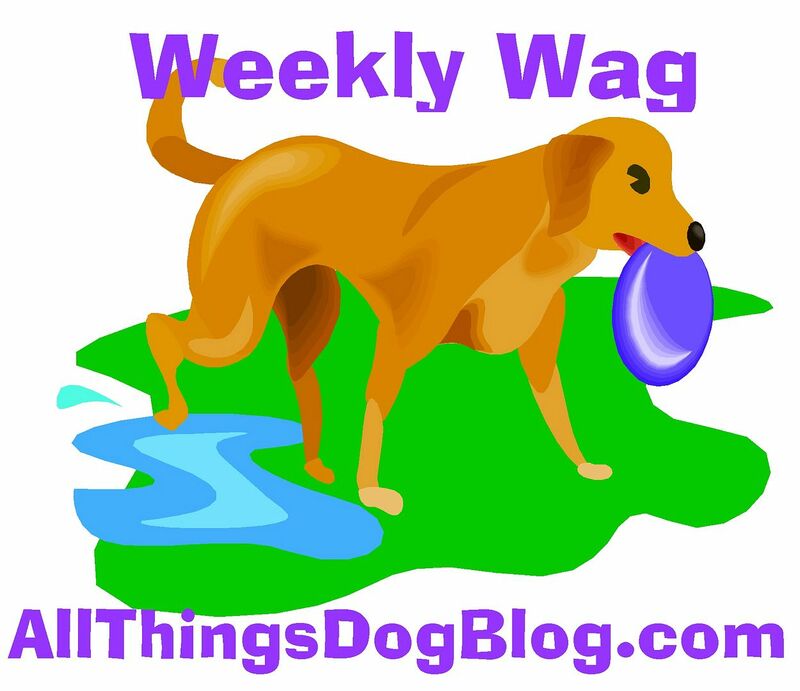 All Things Dog Blog is primarily a resource that provides solutions for living with dogs. 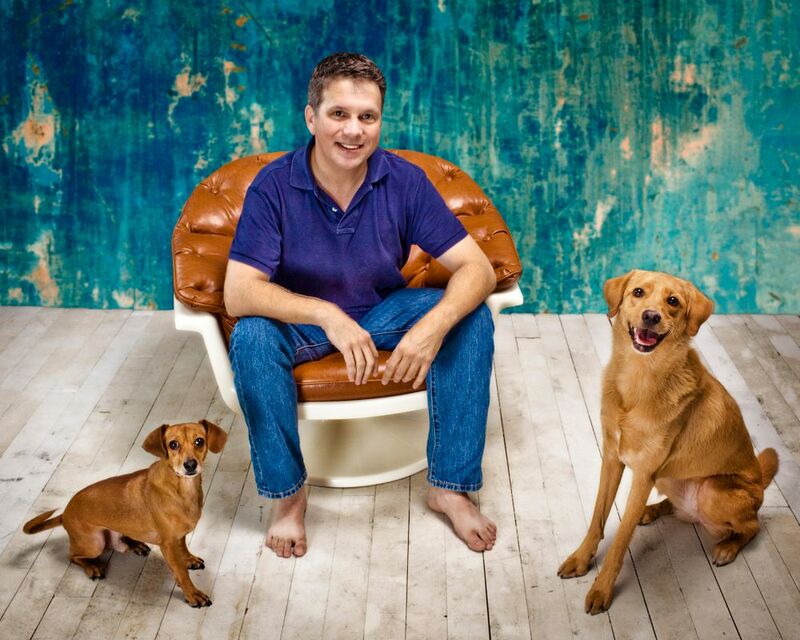 Thus our tagline: Strategies for Happy Dogs and Happy Families. 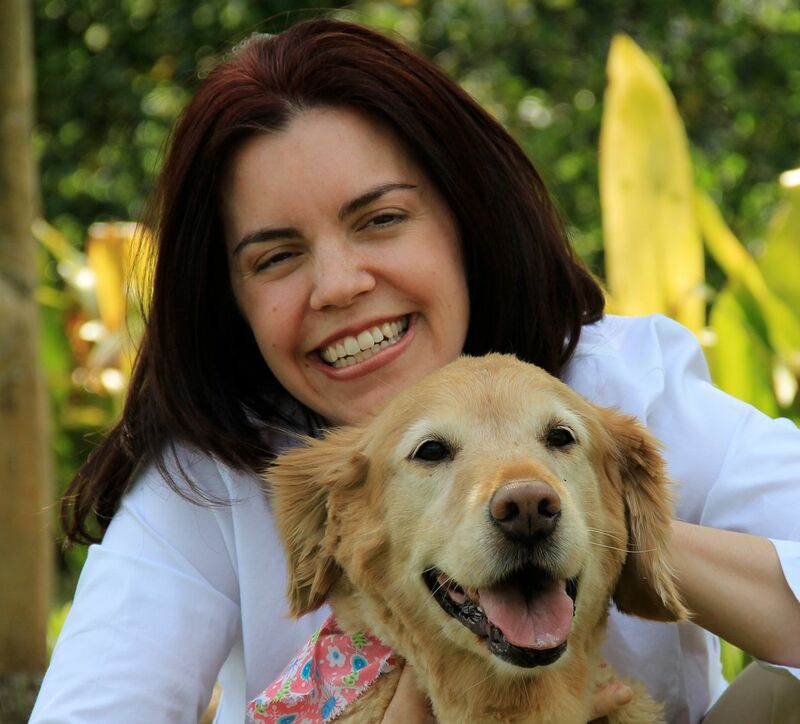 In addition to my problem-solving articles, I offer an Ask the Vet column, penned by holistic veterinarian, Dr. Pat Bradley, and an Ask the Dog Trainer column, where your questions are fielded by a team of training professionals. Of course, we have to lighten things up a bit occasionally by tossing in a humorous video, a comic relief article, and inviting our readers to submit their stories for RESCUING ROVER (archives here) and Pup Profiles. We also offer a Rainbow Bridge Memorial to our readers who wish to have a serene place to remember their fallen pups. With beautiful music playing along with a nice video, you can visit the pups that have joined your loved one, adding their photos, poems, comments and such to our place to remember them by. My Xena is there now also. Got questions? We've got answers. You can reach us at LetsAdoptaDogPark@gmail.com. Find us on Facebook and Twitter too. Hope to hear from you soon. Happy tails! Wow! Very nice blog! How long have you been doing this and any advice for newbies? Really liked meeting your fur family. Loved the image of Tanner doing a victory lap at the dog park. My golden, Honey, does a victory lap at nose work classes after she's found the treat. Thanks for taking part in our first hop! I think Tanner is absolutely gorgeous, btw!